Food trucks are a culinary phenomenon that have taken off around the world over the last 10 years. But really it isn’t a new concept. People have sold food on the street since ancient times. Living conditions were cramped and most people didn’t have kitchens, so vendors would sell food from small carts or street kitchens to locals. And really this way of preparing and serving food never went away, continuing throughout the world, especially in urban areas. These days food trucks are more common all over the world than ever. You can find food trucks in every type of cuisine, from a simple grilled cheese sandwich to tasty Asian fusion bites and even sweets like doughnuts, ice cream and cupcakes. And you won’t just find them in busy urban centres anymore either. Food trucks are starting to take over the suburbs as well. Festivals and markets dedicated to the humble food truck are also becoming common and I don’t know that I’ve ever been to a music or cultural festival for the last few years without there being at least a few food trucks present. 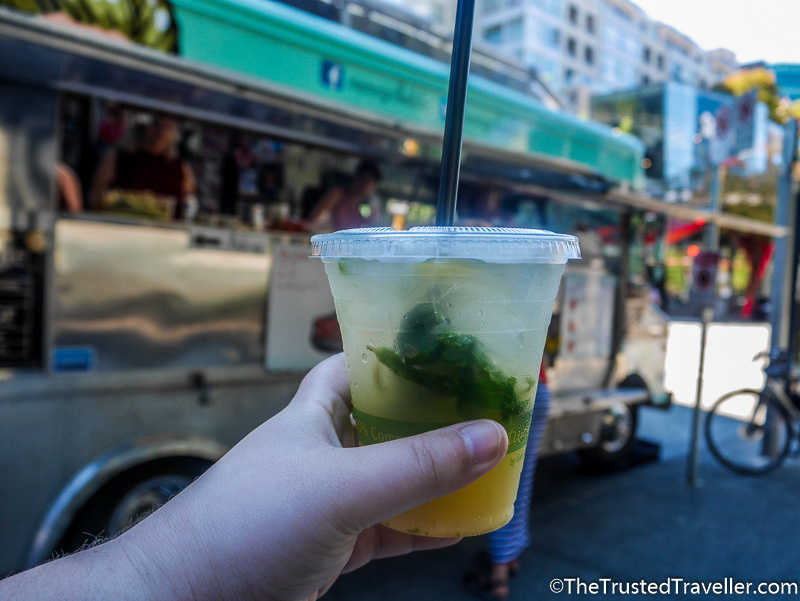 With my love of food and culinary travel experiences, when I discovered the multitude of food trucks in Vancouver, I knew I had to visit as many as I could during my visit. 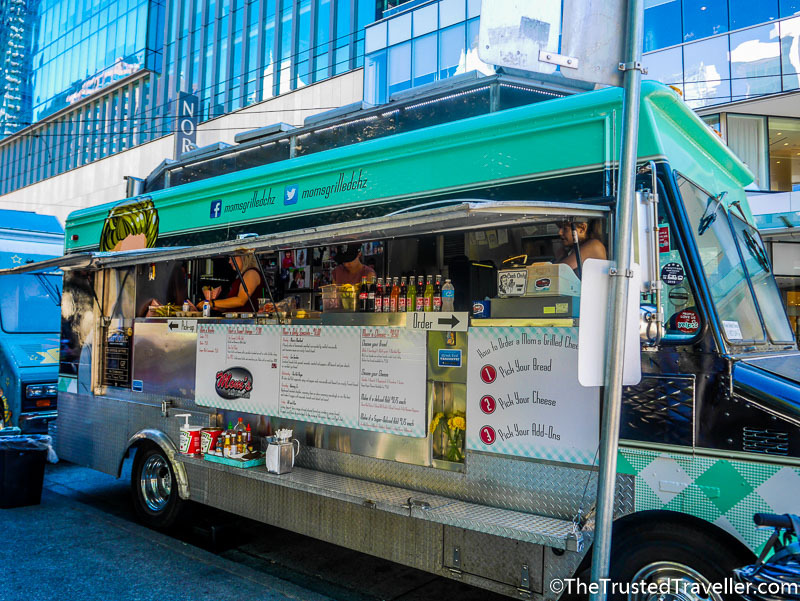 There are up to 120 food trucks on the streets of Vancouver at any one time. 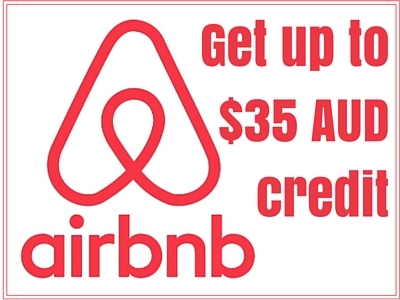 For someone visiting for just a week, that is an overwhelming number to try to tackle or even whittle down to the best (let alone knowing which are the best!). 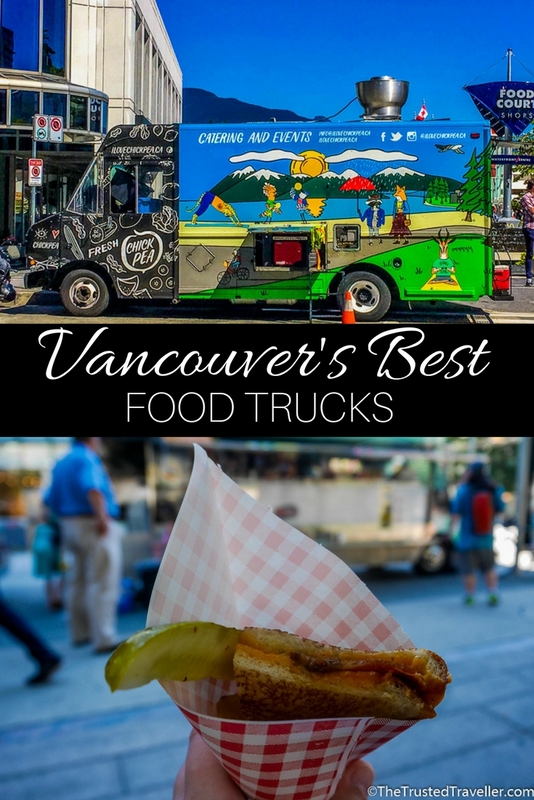 So while planning my trip, I went in search of a tour that would take me to visit the best Vancouver food trucks without me having to do too much hard work. 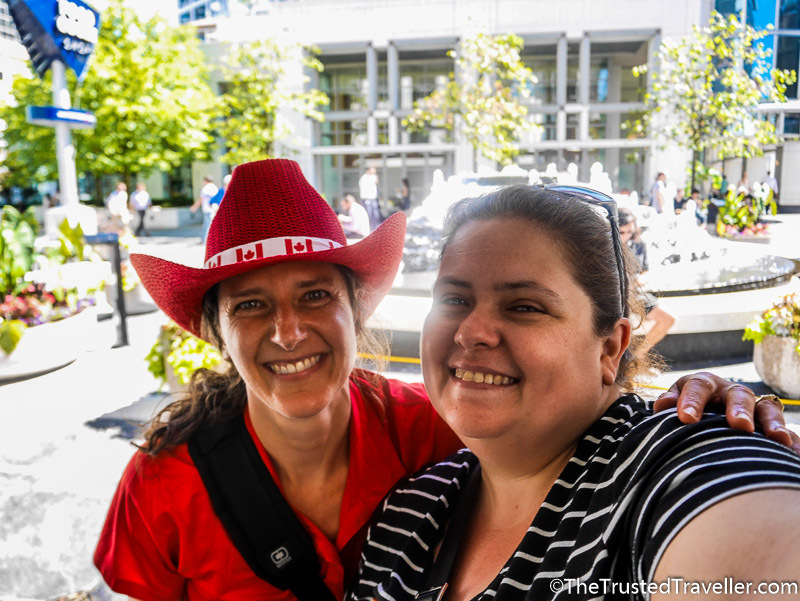 Vancouver Foodie Tours offer just that! I took their World’s Best Food Truck Tour and had a blast. 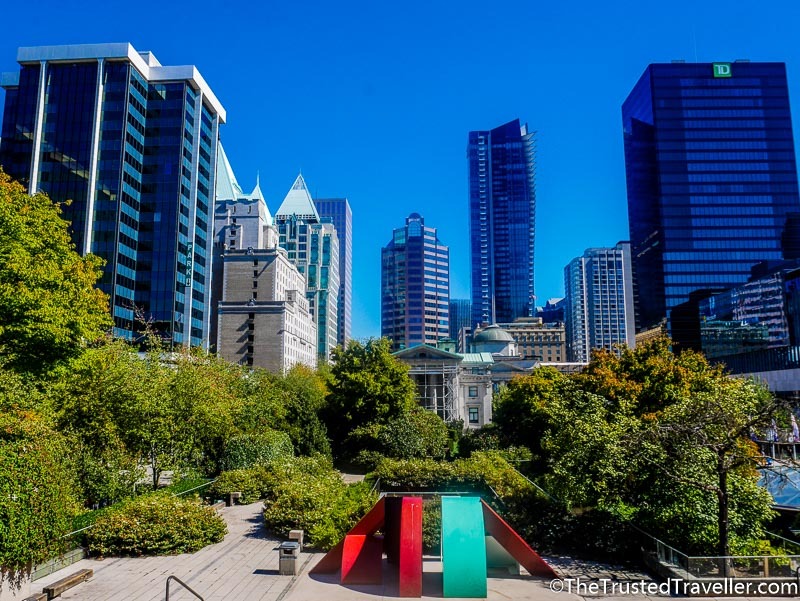 Here’s a few things you should know about the tour to help persuade you to book yourself a place on your visit to Vancouver. Having experienced many tours over my years of travels, what I have come to realise is that my enjoyment on a tour is usually heavily influenced by the guide. If the guide is great, knowledgeable, funny, passionate etc, then I am more likely to have a great time. If they just seem to be going through the motions, then I tend to get bored and have a less enjoyable time. Well, I am very pleased to say that with my Vancouver food truck tour I was in luck! Lisa greeted me at the meeting point with enthusiasm and straight away I felt like it was going to be a fun few hours. As the tour went on and Lisa spoke about Vancouver’s food truck scene, her passion and knowledge for it shone through. And it wasn’t just the food trucks that showed this passion, she really seemed proud to be showing visitors around her city. Walking between the food trucks, Lisa took us to some of her favourite secret spots in the city and she had plenty to say about the city’s present and history too. Lisa and I got to talking about our love of Japanese food and the Izakaya scene in Vancouver. I really felt like I was spending a few hours with a like-minded friend, and not on a tour with a complete stranger. During the two-hour tour we visited four food trucks with the first truck at the starting point and the last truck being the finishing point of the tour. At each truck we were each served about a half-portion serving of a signature dish, so make sure you come with an empty stomach and a bottle of water! Here’s a run down on what to expect and what I enjoyed about each truck. 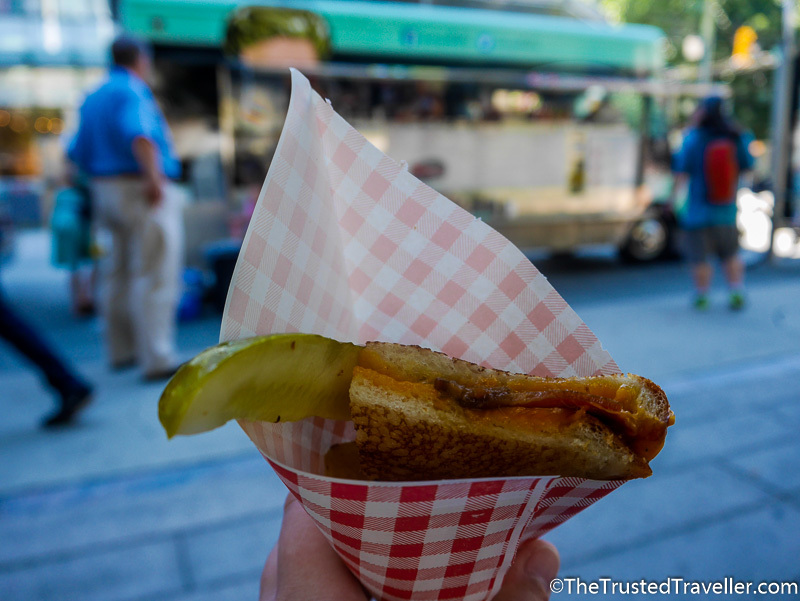 Regardless of whether you do a food truck tour or not (but you really should! ), you absolutely cannot miss a visit to this Vancouver institution which has become so popular it now has locations in the US too. 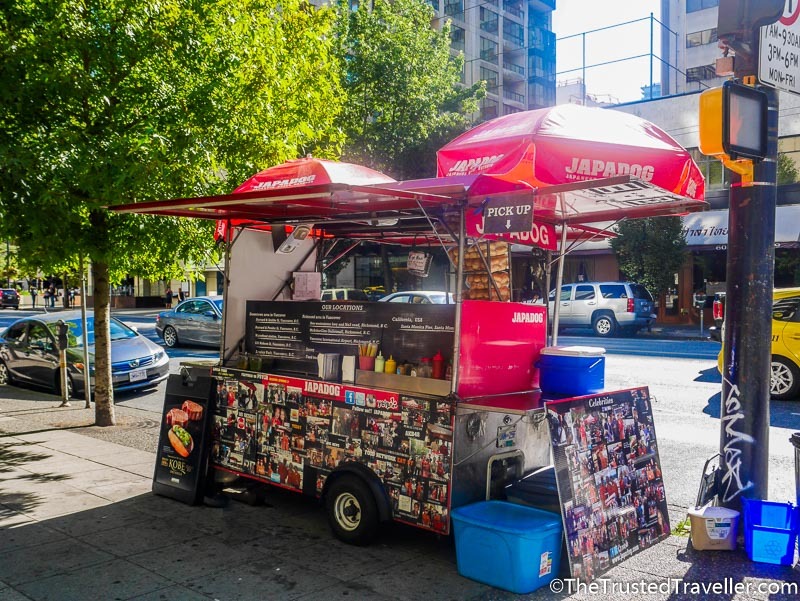 You’ll find JapaDog carts in a few places around Vancouver but this particular tour started out in their original location on the corner of Burrard and Smithe Streets, right in the heart of downtown Vancouver. So what is a JapaDog? Basically it’s a hotdog topped with Japanese flavours. What’s not to like about that! 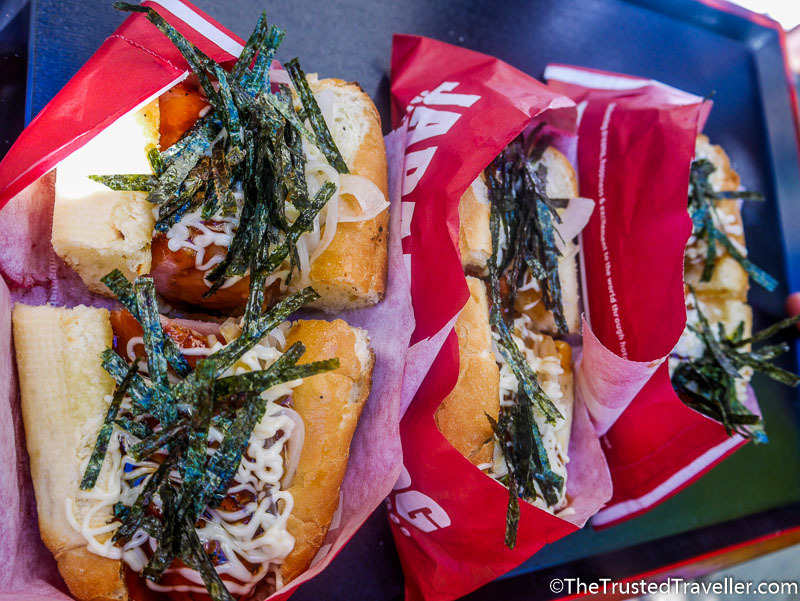 Our tour taster was of their signature dog call Terimayo, a pork hot dog topped with teriyaki sauce, Japanese mayo and a sprinkling of seaweed. Now I’ve never been much of a hot dog fan, probably because in Australia they are found bobbing around in days old water in a convenience store. But this JapaDog hot dog was nothing like that at all. On first bite I was instantly transported back to Japan. The flavour combo is perfect and after finishing my portion I wish I could have had more. It was my favourite bite of the tour! Our second stop, Mom’s Grilled Cheese, was just a few minutes walk away. This hard to miss food truck has a permanent spot right next to Robson Square on Howe Street. Because of its location, it is a super popular spot for nearby office workers to grab their lunch, especially on a nice day when they can sit in the square and enjoy it. First up we were served a delicious homemade ginger and mint iced tea. With the unseasonably warm temperatures during my visit, this was a refreshing, tasty and welcome treat. Then for the main event, the grilled cheese. Served in a red and white checkered cone, we ate grilled cheddar and bacon with a side of complementary pickles and crunchy potato chips. Easily the best grilled cheese a Mom has ever made me! After a walk around the block to visit more of Lisa’s secret Vancouver spots, we ended up right back next to Mom’s at the Tacofino food truck. Really the name says it all, Tacofino serves up some of the city’s best tacos. Our tasting for the day was something I have never tried before, a fish taco. And I’m pleased to say it was delicious! The fish taco is probably their most popular one and I can absolutely see why. Served on a super soft tortilla, it comes with a piece of light and crispy pacific cod topped with cabbage, chipotle mayo and salsa fresca. It is full of fresh flavours to that counteract perfectly with the mild spiciness . Tacofino is also where we picked up our dessert, a famous Diablo cookie. We could choose to eat this spicy chocolate cookie right away or save it for after our last stop. I tucked mine away for later. This vegan food truck has become so popular that they have recently opened a restaurant in Vancouver. 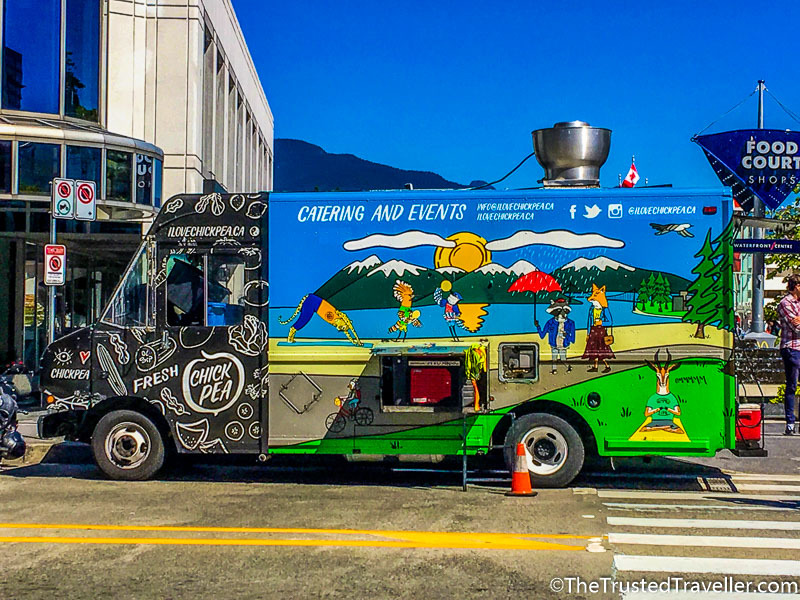 The I Love Chickpea food truck is located at the intersection of Hornby and Cordova Streets just outside the Waterfront Centre and just a few steps away from popular Canada Place. Again it is super popular with people from the surrounding office buildings at lunch time. Starting out as a vegetarian food truck, I Love Chickpea recently went fully vegan, removing eggs from all of its food. For someone who hasn’t eaten a lot of vegan food in the past, I can honestly say that I couldn’t tell the difference with my delicious serving of falafals, dips and pickles that it contained no egg. Make sure you get yourself a decent helping of their free sauces too. The basil sauce was my favourite! When you are on vacation, especially for a few weeks, the price of doing tour after tour can really start to add up. 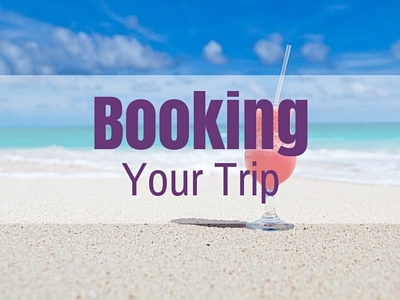 Unfortunately, a lot of the time, tours are overpriced and you can usually do them much cheaper if you planned the itinerary out for yourself. But I think Vancouver Foodie Tours has really got the value for money factor covered. The World’s Best Food Truck Tour starts from just $51.99 per person. 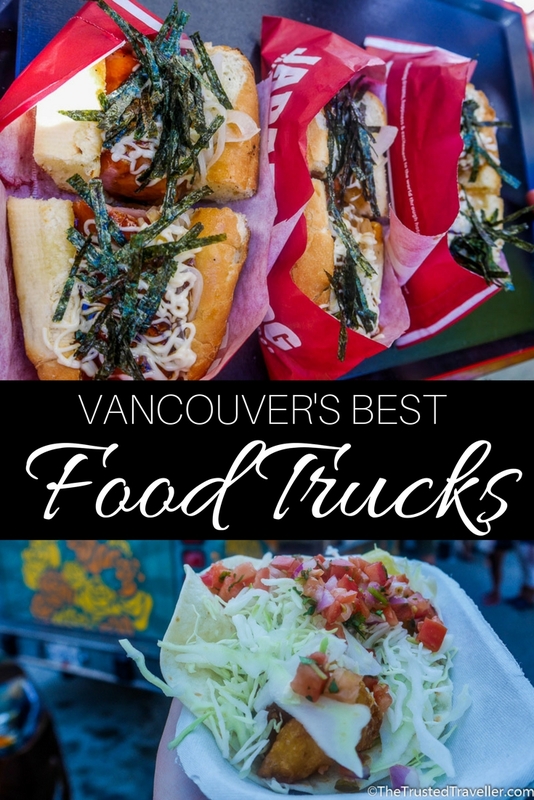 This includes two hours, four fantastic food trucks, six different tasters that were all very generous in size (way more than I would normally eat for lunch), a guide-book to the other food truck locations around Vancouver and, as I mentioned earlier, a knowledgeable and passionate local guide. Vancouver isn’t a cheap city. There are some restaurants in the city that if you were to be served an equal amount of food, your bill would be creeping close to (if not more) the price of the tour. The World’s Best Food Truck Tour runs from April to October a few times per week. Tours start at 11am and run for two hours with four food truck stops and ample food samples. As I mentioned earlier, make sure you come with an empty stomach and a bottle of water. Wear comfortable walking shoes as this is a walking tour. The longest period of walking was about 10 minutes and the pace was kept comfortable for all guests. There was one flight of stairs to walk up at one of Lisa’s secret spots, but this was not mandatory. Tours run rain or shine so make sure you check the weather forecast before setting out to make sure you have the correct gear. Vancouver’s weather can change rapidly so be ready for all seasons in a day. Groups are limited to 15 so it is a nice intimate experience. I was one of five people on the tour and I enjoyed chatting to my fellow tour mates about food and our travels. Minimum numbers apply for a tour to go ahead. For more details and to book, check out the Vancouver Foodie Tours website. They also offer a range of other food based tours that you might like to experience during your visit. Disclaimer: Thank you to Vancouver Foodie Tours for hosting me. As always, all opinions expressed in this post are my own. 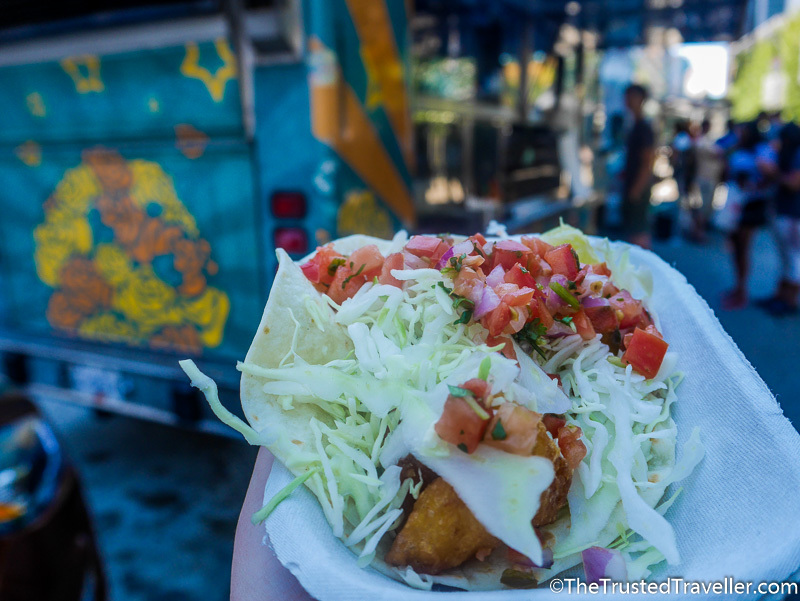 Where in the world have you experience the best food trucks? 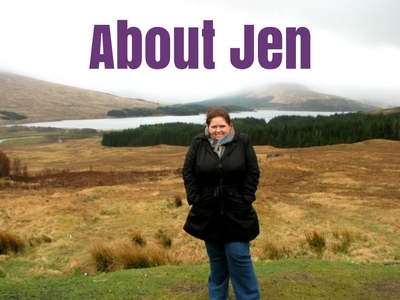 Hey Jen, absolutely love any post about food and food trucks in general (doesn’t hurt that it’s the amazing Vancouver too :>). They are such a great way to sample awesome food on the go, but they have been slow coming over here to Switzerland! I fell in love with the trucks at SXSW festival in Austin a few years ago, and then a few back home on a visit to Australia. But now they are here too, and at dedicated summer festivals! Awesome. Thanks Roger. I know how you feel as they are only just getting going here in Sydney and no where near as great as Vancouver yet. Just another excuse to visit NA again I guess! What a great spot to live! I stayed on Smithe for a few days at the end of my trip and loved that I could walk everywhere. 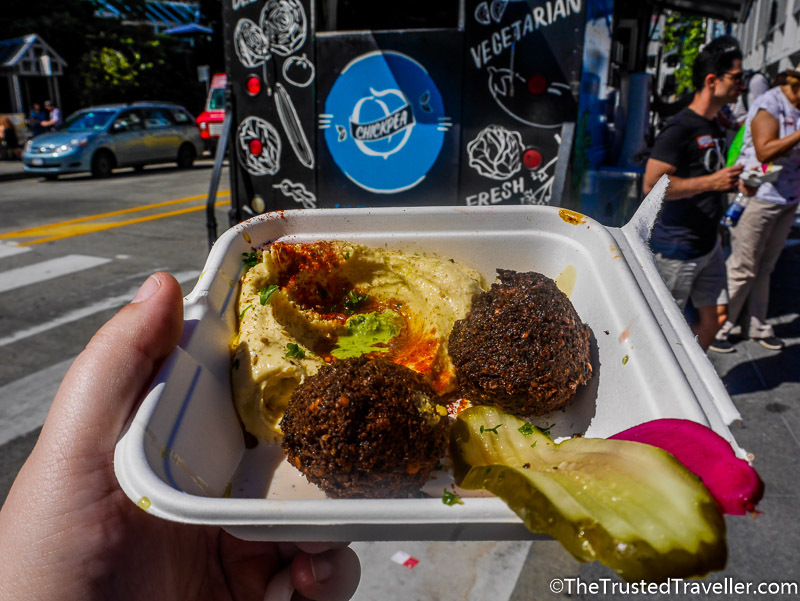 You’ll have to go back to Vancouver so you can check out I Love Chickpea! We had lunch at I love Chickpea last year, and it was amazing! Plus it was all gluten-free so I didn’t have to worry about a thing. They’re chips were so delicious!! It is a great truck. I’ll be hunting it down when I go back to try the chips!